Discussion in 'Guitars in General' started by jdogric12, Apr 22, 2016. ...'81 Roland G-505. For some reason I just enjoy playing it (even without using the synth parts) more than any Fender Strat I've tried or owned. Don Grosh Retro Classic....early one with Fralins. MaxLikesMilk and scolfax like this. 2015 TMG Dover medium relic with Humbucker Bridge/Sliders pickups. The neck is sublime and the sound with and without pedals is great. My 2009 EJ. Either that or a K-Line that the store sold before I could scrape up the funds. I didn't play it long enough to be sure. 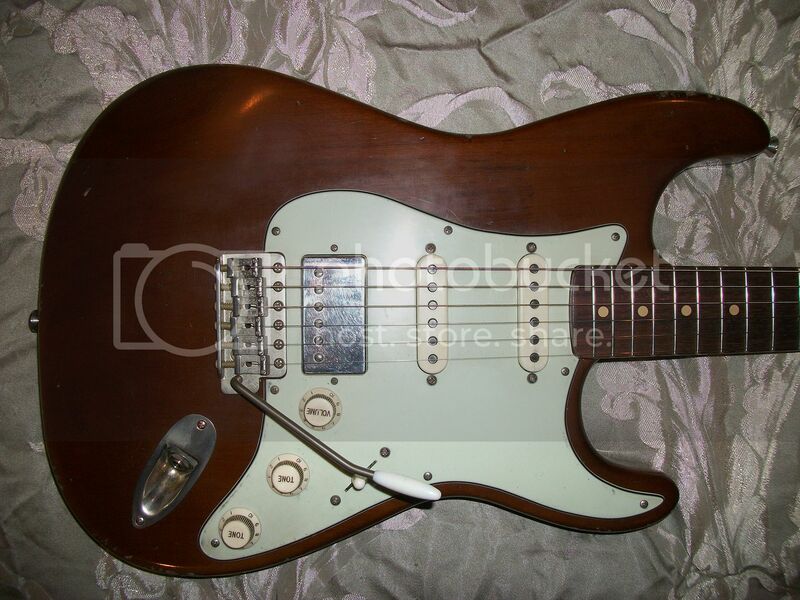 The '06 Heavy Relic '56 Strat I have now is the best I've owned or played on almost 53 years of playing. It's everything I could hope for a Strat to be. I guess I should add that even when I've had good Strats I always had at least two and sometimes several. In the 10 years I have had this one I have had no desire to play any other and it's been the only one. The only one I own now. '08 American Standard with Lollar Blackface pickup set and Callaham tremolo. I got it for $500 in a pawnshop. Previous owner did a really amateurish relic job on it and almost all of the black paint was stripped off. I gave it a really amateur paint job with sonic blue nitro spray paint and put aged mint green plastic on it. It's not pretty but it sounds glorious. Not a bad tone to be found. river_jetties, pbmw, infiniteposse and 1 other person like this. moosewayne, Roe and amstrtatnut like this. My 2002 American standard. There is something magical with the maple fretboard on it. Can't explain. My first year production Maple Neck EJ Strat is the best I've owned. Had a chance to spend some time with a 54' Hard Tail that rang like a bell, just a stellar guitar. Had a chance to buy it but it was way out of my league. Same guitar was demoed by Vince Gill, he almost bought it after trying it out. He told the owner that he already had too many vintage strats just like it. He loved the sound but was looking for a particular neck shape. I never will own a vintage strat but I would love a 64 slab board in olympic white beat to hell. Parker P-38 that I modded the poop out of. It sounds more like a Strat than most Strats I've played, and now it sounds really nice and stays in tune pretty well. Richie Sambora US model. The neck on that model was glorious. They inlays were another thing. The FrankenPartscaster I now own: Squier body and hardware, GFS Slick pickups, All Parts TRO-Fat neck, MIM tuners, tortoise guard. Plays great. I'm not buying anymore stock Fender guitars. I'll just put parts together that I like. Fender Custom Yuriy Shishkov Masterbuilt '63. Definitely the closest I will get to vintage. kwd1987, bluesjuke, Man with Gas and 10 others like this. Roe, Cal Webway and amstrtatnut like this. 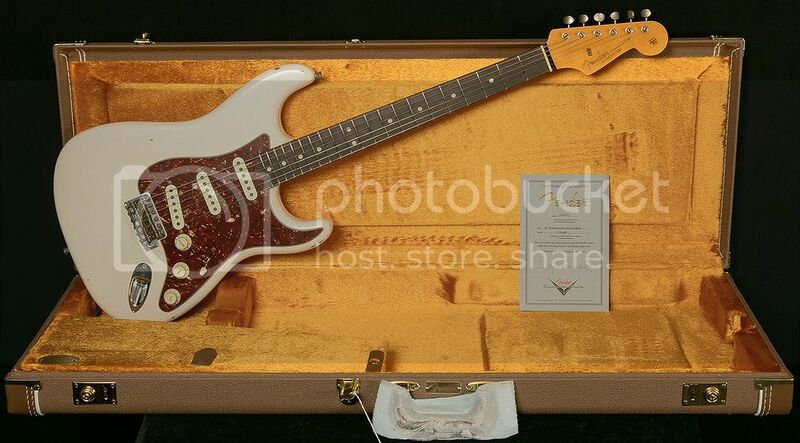 Judging BUILD - my 2011 Custom Shop Jeff Beck Signature. Just sublime fretwork, playability, weight, balance, attention to detail, paint. Purely for tone - a surprising tie... my 2006 Custom Shop Strat Pro SSS for single coil tone, and my 2014 American Deluxe HSS Shawbucker. Man, I've played $5000 Strats from Fender and Suhr and others, and that damn Shawbucker for rock work is phenomenal. Everything a strat should be to me. RYAN1987M and Teleman like this.